Boda-boda riders in Bentiu are embracing road safety and joining the growing wave of peace ambassadors in South Sudan. For the first time, the motorcycle taxi operators will be plying the streets and roads of Bentiu, wearing safety helmets and reflective vests. Provided by the United Nations Mission in South Sudan (UNMISS), the helmets and vests are emblazoned with the message, ‘riding for peace, riding for safety’. “This is a good initiative from UNMISS as we have been suffering because of dust and it was easy for someone to get injured when an accident occurs. But now, we are safe, and we must do all we can to drive safely,” said Kok, the deputy head of Bentiu’s Boda-boda Association. “It is our collective responsibility to spread the message of peace which was brought to us by UNMISS and other peace partners,” continued Mr. Kok, “We have to assist them as we can reach many corners around [Bentiu]. What is written on this helmet and the jackets will also tell that we are peace makers,” he concluded proudly. Mr. Kok was speaking at a workshop on road safety, which concluded with the handing out of the safety helmets and jackets. The workshop was organised by UNMISS’ Public Information Office in Bentiu, in collaboration of the Bentiu Boda-boda Association, and the South Sudan traffic police. “This workshop is very helpful as we have been trained on how we can protect ourselves and the community we are serving when on the road,” he said, recalling what they had learnt. “From today we will change the way we behave, and behave in a good way, as well as spread the message of peace,” he declared. The deputy chief of traffic in Bentiu, Domai Dak Kai was concerned about the possibility of some riders not putting the safety helmets and vests to good use. “These items were not given to you for different purposes, and they’re not for you to keep it at home or sell in the market. It is only for your safety and protection. No one is allowed to sell it out or give it to someone who will misuse it for his own personal gain,” cautioned Dak Kai. “Anyone found riding without a helmet or a reflective jacket will be interrogated or his motorcycle will be detained,” warned the deputy traffic chief. Popular for fast and convenient transportation, boda-boda taxis are a mainstay for Bentiu and Rubkona residents. However, due to lack of safety measures and limited knowledge of road regulations, some young people hop onto the motorbikes and ride without any protective gear, such as helmets reflective jackets, exposing them to life-threatening injuries in case of a crash. William Dak, the Executive Director for Rubkona County, appealed to the riders to show appreciation and put the safety gear to good use. The Head of the UNMISS Field Office in Bentiu, Hiroko Hirahara called on the public motorcycle riders to spread peace messages while on the road. “We want to urge you to spread the message of peace and safety, especially protection of civilians, because you are the champions of peace, safety and security,” she said. 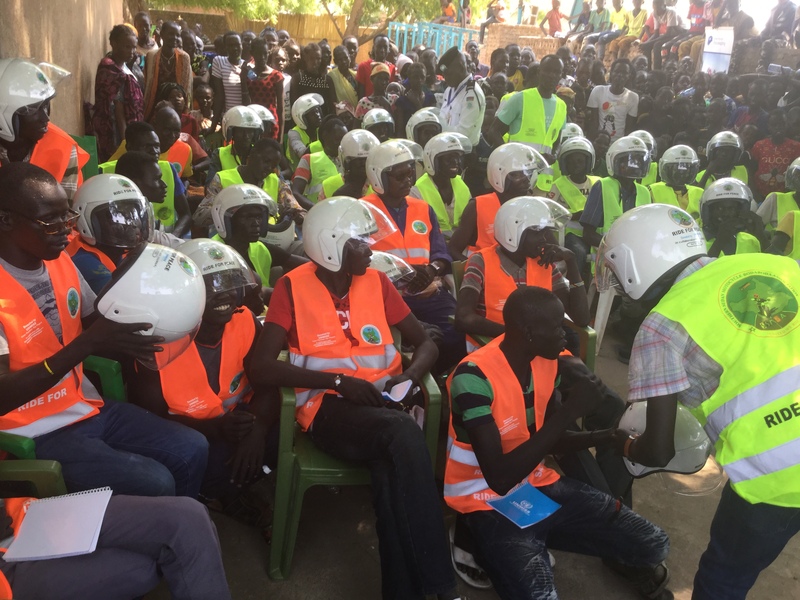 In all, 65 boda-boda riders in Bentiu and Rubkona town were trained about safety and respect for traffic regulations, the revitalized peace agreement, the mandate of the UN Mission, and human rights issues.